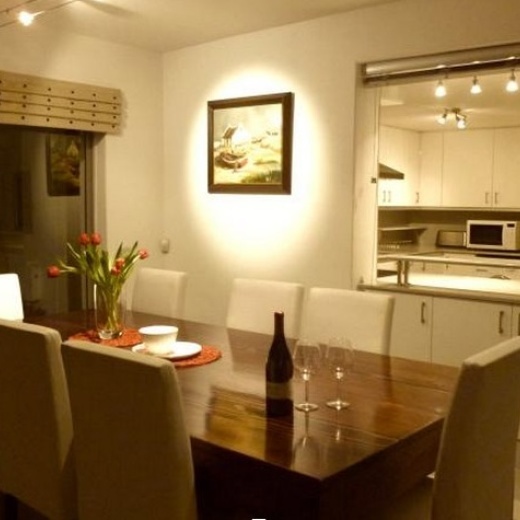 This luxury self-catering accommodation in Tamboerskloof Cape Town is a spacious home sleeping 8. The accommodation is in a quiet street with lovely views on Table Mountain and the city bowl. At night this place is just spectacular. The open plan spaces are an entertainers dream. From the open plan lounge- dining area you walk out on the pool deck. Never is any member of the party isolated from the rest. If you need modern appliances for comfort then everything you need is here. On the ground floor you’ll find one private en-suite bedroom next to the pool. On the top floor is the main en-suite bedroom, the third room with a double bed and the fourth bedroom ideal for two kids or one adult, on luxury bunk beds. There’s a family bathroom for the third and fourth bedroom. All top floor bedrooms lead on to a lovely patio with views across town.